How is it that I’ve forgotten so much of Eli’s childhood already? We’ve never had a video camera, and for his first two years, we didn’t have a digital camera either, so his baby years aren’t extremely well documented. But even now as I try to think back to his first crawl, walk, words, etc…it’s all so fuzzy. How can I love God so much, yet at times be such a wretched person? And knowing that David, Jacob, Solomon, and the like did bad things doesn’t help. There are times when I can’t believe the mean, selfish, thoughtless things I do, and question my true love for God. Do people REALLY get sent to hell? I worked for a couple of years with a guy (he was 50 yrs old at the time) who was a man of faith, and truly believed that all mankind would be in heaven, that God was a God of such deep, fierce, unimaginable love, that He would bring all peoples, past, present and future, to live for eternity with Him. He didn’t share this thought much, because other people would break into arguments with him. But when he and I talked about it a couple of times, I have to say he made a convincing argument. At what point will scientific breakthroughs and discoveries cease? Is it possible, that at some point, we will have discovered and invented and researched all there is in the world of science? God, can you please help me fathom the reaches and intricacies and awe of the universe? Is God actually still active in the lives of humans today…..or does life just happen as it happens, and we sometimes attribute things to the hand of God? What will my son be like when’s he’s 20 years old? Will he still believe, and have his own faith? Will he be a good person or a bad person, and how much of that will have to do with my fathering? Why is my left foot about 1/3 of a size larger than my right foot? It’s not cool, because it makes finding a good fitting pair of shoes more difficult. Is it possible to do anything in life without some type of selfish motivation involved? I’d really, really love to know if it was 7 literal days, 7 geological eras, 7 “God” days, or maybe even a big bang. How old would Michael Jordan have to be before I could beat him in a game of 21? What were some of Jesus’ favorites? Favorite food? Color? Time of day? Season of the year? Old Testament story? Will my questions really be answered in heaven, or will I really not give a crap once I’m there? I have this feeling that once Heaven is my reality, I won’t really care about those questions I’ve always wanted to ask God. Sort of like trying to wrap your brain around how the Egyptians built the pyramids, then when you see them in person, you don’t really care….you just want to admire them for what they are. However, if curiousity is still a valid response upon entering the pearly gates, here are just a few of the questions I would like to ask God. I’m assuming He’ll continue to be all-present at that time, so that I won’t have to make an appointment or stand in line. That would make this much easier. Which is it, really? Nature or nurture? And if both, what’s the percentage breakdown? Did you allow me to break my left arm 3 times in elementary school for a purpose? Does that purpose have anything to do with me being afraid to do anything that might cause injury ever since that time? When my sister was in a car wreck that might should have killed her, did You actually intervene, or was it just pure luck? Do You ever truly intervene, or do You allow things to happen the way they happen, and leave us to ponder the difference? 7 days of creation, or 7 eras/ages of creation, or instantaneous creation, or none of the above? Why not make Your inspired Word a tad more black and white? Wouldn’t that have made faith more attainable for all? Why so many mysteries and grey areas? Are we actually experiencing global warming in the 21st century? If I had chosen one college over another when I was 18, how would my life have been different? When my best friend’s heart failed and he collapsed and practically died right in front of me at the age of 25, was there anything I could have done at that moment that might have saved his life? Could you please quantify the size of the universe, and tell me whether or not it actually ends at some point? In Your eyes, was Dennis Miller the worst Monday Night Football hire ever? Now that I’m in Heaven, what exactly do we do for the next trillion years? Just about anything that can go wrong, technically speaking, seemed to go wrong yesterday at Crossings. I can blog about this only because I’ve had time to calm down about it after 24 hours. But yesterday I was fuming. The Square Room has amazing equipment. State of the art stuff, especially for a small venue. Unfortunately, amazing also translates as complicated. And most of us in the productions team simply don’t know enough about the stuff to fix it if something goes really wrong. Around 7:30am yesterday, Stephanie realizes we’re not getting the computer and the video projectors to link up. Long story short – about 3-4 of us spent the next 100 minutes trying to figure this out. By 8:30, I realized we may need a back up plan. We find our old projector downstairs, bring it up, but can’t get it to work right with our Dell computer. At 9:10am, five minutes before the service, we have this huge blue screen projecting on the wall, trying to get the old projector to work, obviously making the community curious. There are no words to project for the worship set in the first service. Dustin and I are on the floor in the sound area trying to make the old projector work with Bill’s Macbook computer, just so we can project Mark’s teaching notes through power point. We get this to work … sort of. The color is off. Everything projects as green. Mark stalls at the beginning of the teaching so we can run cords and cables into the seating area, put the projector on a music stand, and project a crooked, green colored image onto the screen. It doesn’t fit right, so the lens has to be shifted. This keeps happening throughout the teaching. At one point in Mark’s teaching, confetti randomly falls from the ceiling, out of nowhere. We think it’s leftover confetti from the StarQueen show a couple of weeks ago, but we’re not sure. There’s an important video at the end of the teaching. We can’t show it. First service ends. In the next 20 minutes, we go find the other backup video projector that used to be used for Kids City. It’s smaller and easier to use on a music stand. I frantically type in all the worship lyrics into a power point file, finishing this literally 1 minute before the service needs to start. The smaller projector is easier to use, and projects a more appropriate sized image on the screen. But all the images and words are still green. We figure out later this is due to a bad VGA cable. All the while, Trevor is running sound this morning. Trevor’s a great sound guy, but he had never run sound on his own since moving to The Square Room. The board is vastly more complicated than our old one. Our normal sound guy was not able to make it, so Trevor filled in. Robert, who was supposed to play electric guitar, agreed to play bass about 45 minutes before the service was supposed to start. At one point during Mark’s teaching in the 2nd service, the sound board reverted itself back to previously customized settings that we don’t use. It made an extremely loud feedback noise that hurt everone’s ears and caused Trevor to literally jump out of his seat. So, 2nd service goes on. Green words. Green teaching notes. Loud haunted sound system feedback. We decide to try and run the video after common meal. It’s on Bill’s computer, but I’m not a Mac guy and have no idea how to make it run or project correctly. So we run a 3 minute video, in green, that is never fully projected on the screen. I can’t even explain the ridiculousness of what this looked like. It was hilarious. And through it all, sitting beside me, my friend Kristin, who’s running lights, is laughing, smiling, shaking her head, and offering humorous commentary. I think she was the very first person to notice the falling confetti. And she couldn’t stop laughing for about 5 minutes. And here’s the kicker. We still had church. We still met as a community. We still worshipped. We still engaged in the story of the “Triumphal Entry”. We still communed with Christ in common meal. We still laughed. We still “woo hoo-ed”. We place a good bit of dependance on sound, lights, cables, mics, screens, and other technical things. But we’ve discovered more than once that those things are certainly not central to our community. Our worship, friendship, engagement in the teaching, enjoyment of common meal … all of these things transcend technical difficulties. They remind us we are still just flawed humans loved by God, and that we still look forward to being together, even when things don’t work out as planned. It’s almost as if God “confused our speech”, just to make sure we realize that “this is not about that.” This is not about that. And that’s a very good thing. We recently visited Cumberland Falls, off I-75 exit 25 just north of the border in Kentucky. Notice the beautiful falls in the background….and, if you can see it, the large collection of trash beside the bolder in the middle of the photo. Also (with no picture needed), I’m not making resolutions this year. I know the things I need to do to be a better person, to feel better, to be healthier, and to live out the calling of God in my life. Writing them down specifically and then somehow not fulfilling them is a bummer, and one “goal” of mine this year is to simply be a more optimistic, positive person. Let me just say this…I’m praying about (not for) redirection in my life. I’m experiencing a great struggle regarding the unfulfilled calling of God in my life, and I’m just not sure what to do with it. I’d love to just turn my face to the wind, leave everything to His providence, and spend my days serving and ministering to people in need. But I’m also quite logical and rational (whether these are Godly traits, I have yet to discover). I realize that I have a sort-of secure job, a paycheck, debts, a family to care for, and (still) some legal limitations on what I’m able to do. That leaves me where I’ve been many times before….just wishing God would miraculously make everything happen the way I think it needs to for debts to be paid, histories to be wiped clean, and doors to be opened. I have a great desire to serve the community, but do little to seek out opportunities to do so, almost scared of what God may do to my heart, and what He may ask of me. So maybe my real resolution for this year is to learn how to open myself up completely to God’s will for my life, and trust where it leads. Maybe it keeps me right where I’m sitting. Maybe it turns my world upside down. Maybe it does both…or neither. Either way, if 2009 can include more of Him and less of me, it will ultimately be a great year. it’s 1:17pm on Thursday afternoon. We’re driving through the mountains just about 20 miles to the south east of Asheville, NC. The trees are as bright and as colorful as you could possibly ever imagine them being. Red, auburn, orange, brown, green, yellow, sienna…absolutely, wonderfully, amazing. It is in a setting like this that I am most often reminded of the glorious greatness of God. Of how spectacular, creative, and wonderous He is, and how fortunate I am to be able to live a tiny bit of a life in the earth He created. For the last 20 minutes (my boss Keith is driving right now) all I can do is crane my neck around to see all the views…and it will be another hour or so before we finally get through it all, so I’ve much more to see and take in. I absolutely have to find a way to get to the mountains with Erin and Eli this weekend to take this all in before the leaves fall and winter ensues. It’s just too beautiful to miss. Made some spaghetti last night, with meat sauce. Yummy. I’ve been in the habit of bringing my lunch to work for a long time now … can’t really afford to buy lunch everyday, not really sure how so many others can … and spaghetti is a great lunch option. For about $6.00 you can make at least 5 servings of sketti and meat sauce, which provides a meal at home for 2 and 3 days worth of lunch. Perfect. Yep, it’s just what it looks like. 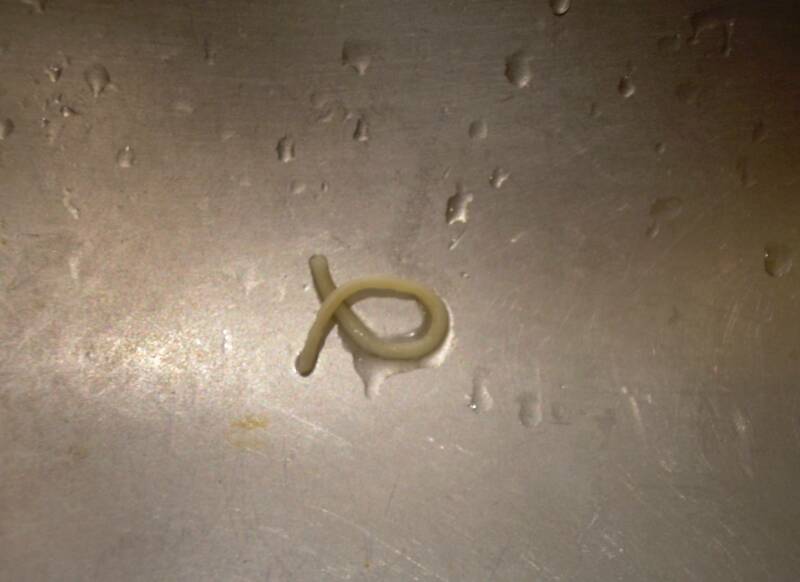 A small piece of leftover spaghetti that didn’t get washed down the drain, in the undeniable shape of an ICTHUS fish. I had to take about 10 pictures to get one that looked okay, since the stainless steel sink kept reflecting the camera flash. Finally, Erin held a flashlight over the ICTHUS spaghetti fish, I turned off the flash, and captured the image you see here. What does it mean? I made some dinner and cleaned up afterward, so I performed my husbandly duties okay. No problem there. I made reasonable sized servings, so no gluttony. Should I be eating MORE spaghetti? Is it really good for me? Do I need to think about God more while I’m cooking, being thankful for the opportunity and for the food provided for us? Maybe, just maybe, if I look at my sink closely enough, I’ll find a sublimal image of the Virgin Mary. And the ICHTHUS spaghetti fish is likely sitting right where her stomach is, an obvious metaphor of the fact she carried the hope of mankind in her womb. Or maybe, just maybe, the spaghetti poured onto the sink, this piece got stuck, some water flowed on it and caused it to move a little, and it ended up looking like a well known Christian symbol. I don’t know. What I do know is that if I ever see several grains of rice clumped together in the sink in the shape of a cross, I’m going to totally freak out. What the great Albert Einstein thought about God, faith, and the Bible?